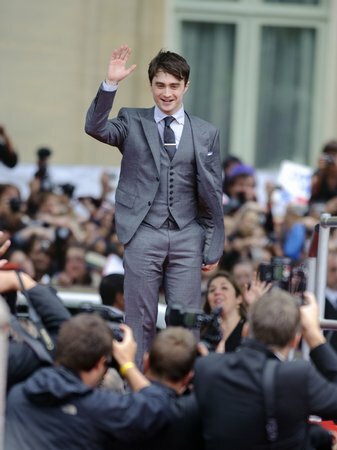 Daniel Radcliffe arriving at the world premiere of Harry Potter and the Deathly Hallows Part 2, in Trafalgar Square in central London. Rupert Grint, Emma Watson and Daniel Radcliffe at the world premiere of Harry Potter And The Deathly Hallows: Part 2. L-R) Daniel Radcliffe, JK Rowling, Emma Watson and Rupert Grint at the world premiere of Harry Potter And The Deathly Hallows: Part 2. Helena Bonham-Carter arriving for the world premiere of Harry Potter And The Deathly Hallows: Part 2. Miriam Margolyes arriving for the world premiere of Harry Potter And The Deathly Hallows: Part 2. Tom Felton arriving for the world premiere of Harry Potter And The Deathly Hallows: Part 2. Julie Walters arriving for the world premiere of Harry Potter And The Deathly Hallows: Part 2. Clemence Poesy arriving for the world premiere of Harry Potter And The Deathly Hallows: Part 2. Jim Broadbent arriving for the world premiere of Harry Potter And The Deathly Hallows: Part 2. David Thewlis arriving for the world premiere of Harry Potter And The Deathly Hallows: Part 2. Emma Watson in tears the world premiere of Harry Potter And The Deathly Hallows: Part 2. Emma Watson at the world premiere of Harry Potter And The Deathly Hallows: Part 2. JK Rowling at the world premiere of Harry Potter And The Deathly Hallows: Part 2. Emma Watson and JK Rowling in tears the world premiere of Harry Potter And The Deathly Hallows: Part 2.